Drawing inspiration from classic workwear, this Chimala shirt jacket has been hand-cut from breathable cotton Panama cloth by artisans in the label’s Japanese workshop. 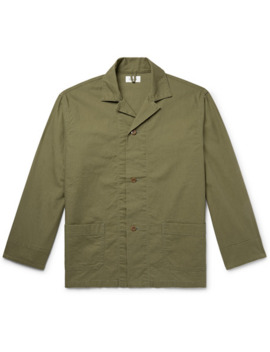 The camp collar, slightly short sleeves and front patch pockets really enhance the retro feel. Shown here with visvim jeans, Our Legacy shirt, Converse sneakers.